Sunny. High 84F. Winds light and variable.. The massive college admissions scam - where rich and famous people in California are being charged with cheating and paying bribes to get their kids into top colleges - is only the tip of what is said to be a really dirty iceberg. And so far, President Trump is not being blamed for it by CNN. But the admissions scandal tells us a lot about what's wrong with some of today's "elite" parents - and their spoiled kids. Many wealthy moms, dads and partners think that unless their kids are accepted to a top school like Yale, Stanford or the University of Southern California, their kids will turn out to be losers or pieces of dirt. They often pressure their kids: "You've got to go to college - and you have to go to this college." The rich parents and TV stars being charged so far in the admissions scam apparently went the extra mile to make sure their kids got into the best school: they cheated their fat wallets off. Dozens of parents paid between $15,000 and $75,000 to hire a college admissions prep company run by a crook who arranged for someone to take the college boards for their dumb kids. Other parents paid huge sums that were used to bribe coaches at nine top schools to accept their kids as recruits to their athletic teams despite their nonexistent credentials. Here in La-La Land, the actress Lori Loughlin, who played Aunt Becky on "Full House," and her husband allegedly agreed to pay bribes totaling $500,000 to have their two daughters designated as recruits to the University of Southern California crew team. For good measure, they sent in photos of the girls sitting on rowing machines. Trouble was, the only boat the kids were actually qualified to be on was the family yacht. What the cheating parents of California did was not just criminal. It was also stupid parenting. Buying their kids spots at Yale or USC might make sense if the kids already are geniuses, super talented in a sport or know exactly what they want to be in life - a computer software engineer, a neurosurgeon, a rocket scientist. But in the vast number of cases, where 18-year-olds have no clue why they are going off to college, it wouldn't matter what school their parents sent them to. It's not the "YALE" on junior's jacket or the "USC" on missy's sweatshirt that is going to determine how their lives turn out. It's about who the kid is inside. And what he or she is going to become in life depends on how well they were raised and if they do the right things in college. If they study, if they learn, if they are serious, if they don't blow their own or their parents' money by taking Mickey Mouse courses, they can get whatever they'll need for a successful start in life at a smaller private college like Creighton or a giant university like Arizona State. You never know, some kid could study economics at some tiny private, non-profit Christian liberal arts college in Illinois and become president someday. Which is what my father did. He studied at Eureka College, then read books and kept learning his entire life. He didn't have to go to Harvard or Yale with the Bushes, Kennedys and Clintons to become a success because his success was all about himself and his character. Speaking of character, those substandard rich kids who benefited from the admissions scam are as guilty as their cheating parents. Not legally, obviously, but morally. They received stolen goods - prestigious college educations that otherwise would have gone to others who were academically or athletically qualified. To say they didn't know what was going on is idiotic. They were silent partners in their parents' crimes. And getting tossed out of their schools ASAP, which they deserve, might actually teach them an important lesson about right and wrong that their cheating parents never could. Copyright 2019 Michael Reagan. 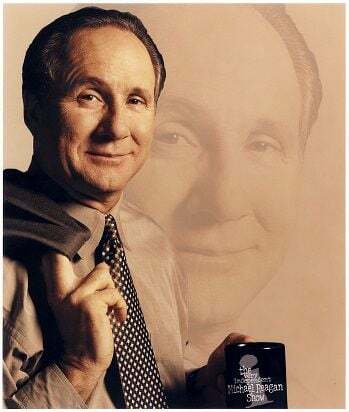 Michael Reagan is the son of President Ronald Reagan, a political consultant, and the author of "Lessons My Father Taught Me: The Strength, Integrity, and Faith of Ronald Reagan." He is the founder of the email service reagan.com and president of The Reagan Legacy Foundation. Visit his websites at www.reagan.com and www.michaelereagan.com. Send comments to Reagan@caglecartoons.com. Follow @reaganworld on Twitter.